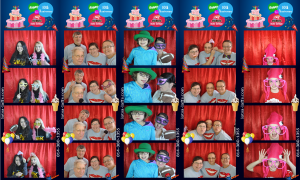 Lotsa Laffs Photo Booths At The State College Dairy Queen 10th Anniversary! Lotsa Laffs Photo Booths was part of the week long State College Dairy Queen’s 10th Anniversary celebration leading up to their official anniversary on February 6th. The dining area was aligned with pictures from the past 10 years. Each day was set aside with an awesome treat for the day, reminiscing or special day to have fun with the kids or to treat your significant other with a DQ meal and ice cream treat. It was great to see the many faces that manned the counters and birthday parties in the last 10 years. Lotsa Laffs was on hand on February 3rd as DQ held a DQ Children’s Day. Games were held inside along with a magician performing magic tricks for patrons. Kids had a chance to win some awesome ice cream treats playing hockey and fishing for ducks. Parents alongside their kids mugged for some neat pictures with Lotsa Laff’s. Lotsa Laffs made some gorgeous custom photo strip borders to help Dairy Queen celebrate the week’s festivities. The State College Dairy Queen’s official anniversary was on February 6th. Many people stopped by along with QWIK Rock and Lotsa Laffs to wish the folks a Happy 10th Anniversary. Everyone had a piece of ice cream cake to celebrate their official 10th anniversary. The ice cream was a treat on the cold snowy day, but the warmth inside made up for the cold winter blues outside. Lotsa Laffs had the opportunity to get Ben Lerner and Don Boller to smile for the camera. Ben walked away saying that this photo needs to be posted for all to see. We even had QUIK Rock’s Diana Stapleford (general manager), Drew Shannon (radio personality), Michael Stapleford (Owner/President) and two interns mugging behind the camera. Congratulations to Dairy Queen of State College on this big milestone! Lotsa Laffs Photo Booths thanks you for allowing us to be part of your celebration days. It was great to see our strips appearing on your walls commemorating the past ten years. We look forward to providing our photo booth at DQ Miracle Treat Day in July!! Happy 10th Anniversary State College PA Dairy Queen!!! What A Party It Was!!! 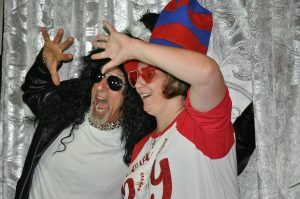 All photos in this blog post by Lotsa Laffs Photo Booths. Copyright © 2018. All rights reserved. Family Portraits At Your Event With Lotsa Laffs Photo Booths!!! 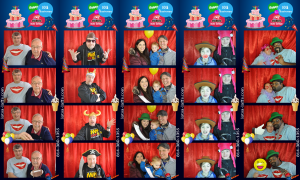 Did you know that Lotsa Laffs Photo Booths excels at capturing family portraits at events? Recently a bride-to-be told us that she didn’t want to have photos with guests using props in her guest book. Instead, she wanted normal pictures of her guests with their signatures to remember the day. Lotsa Laffs mentioned that her guests could take pictures without props at her wedding reception, and they would have a family portrait as a wedding favor for the event. The bride loved the idea and booked Lotsa Laffs for her wedding. Family Portraits at your event with Lotsa Laffs Photo Booths include 4×6 photos of guests (without props) arriving at the reception. Guests place one portrait picture with their well-wishes in a portrait guest book, and the other is their own to keep as a wedding favor. Everyone loves the idea of a family photo without the hassle of scheduling an appointment with a photographer. They walk away with a wedding favor that is never forgotten. Brides and grooms love our family portrait favors and regard them as an enhanced part of their big day. Family portraits can also be sent out to many social media platforms directly from our photo booths. Enlargements of the portraits can be ordered any time after the event. Later on at your special event, we open the photo booth for hilarious fun for your guests WITH PROPS! Your guests will be delighted to have some fun with hats, glasses and other props while mugging for the camera and receiving traditional photo strips as additional favors. At the end of the evening, everybody will be passing their favors around for others to see and admire. This is an absolutely marvelous idea for any event be it a small family affair or a large corporate event. Family Portraits at your event with Lotsa Laffs Photo Booths can greatly enhance your event! Call or text Lotsa Laffs Photo Booths at 814-380-1355 or email us at info@lotsa-laffs.com to discuss using Lotsa Laffs Photo Booths as your portrait taker at your next event! We can open the photo booth for hilarious fun WITH PROPS, later in the evening after family portraits!